La Millasserie is a seventeenth-century country house located in the ancient province of the Perigord, the modern Department of the Dordogne, known as the land of truffles, wine, grande cuisine, and chateaux. The Perigord offers great architecture, great French cuisine, music, art, and antiques, a variety of sports, including cycling, hiking, canoing, and boat trips on the Dordogne. La Millasserie is central to all the sites and sights of the Perigord: 20 minutes from Bergerac and the medieval villages to the south, 35 minutes from Les Eyzies and the world of pre-history, 45 minutes from the Renaissance city of Sarlat and from Beynac, Domme, and the chateaux of the Perigord Noir, and 50 minutes from Perigueux. Our spacious rooms are ideal for long stays. 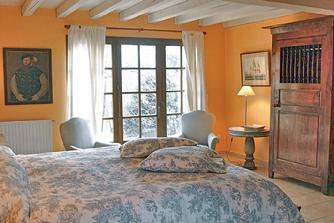 Each room offers a king-sized bed, dining table, comfortable chairs, and an armoire and chest of drawers. Each has an ensuite bath, private terrace, private entrance, and easy access to the pool. Wi-fi connection is free. Pets are welcome with prior arrangement. In the tradition of gay hospitality we welcome gay and gay-friendly guests to our home.